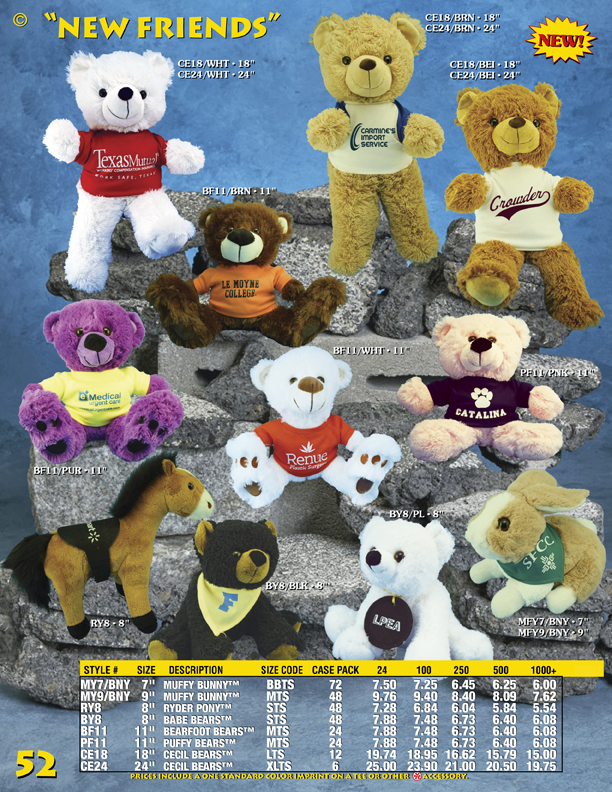 Catalog Page 52 features the Cecil Bears, Bearfoot Bears, Ryder Pony, Puffy Bears and the Muffy Bunny Rabbit. The Cecil Bears are available in 18" and 24" sizes. The Bearfoot Bears have embroidered paw prints. The Bearfoot Bears are available in purple, brown white and pink colors. The Muffy Bunny Rabbit is available in 7" and 9" sizes. Pricing includes the one-color printed t-shirt. The lead time for production is 14 days. Add an accessory or costume to your teddy bear to help theme the event.